Imagine a true urban village in the beautiful gulf access boating community of Cape Coral, Fl. Tech-friendly, pedestrian-friendly and energy-efficient. Shops, offices, restaurants, townhouses and condominium residences; a center that provides a “sense of place” where residents can truly work, live and play. That’s the vision the developers have for this mixed-used project in the heart of downtown Cape Coral. Downtown Village Square is a multi-building community which will include a quarter million square feet of restaurants, shopping, office spaces, residential condominium units, an internal public square and ample publicly supported parking facilities. Panoramic views of the Caloosahatchee River and surrounding city will be available in the commercial floors above 4 stories and in the residential towers. 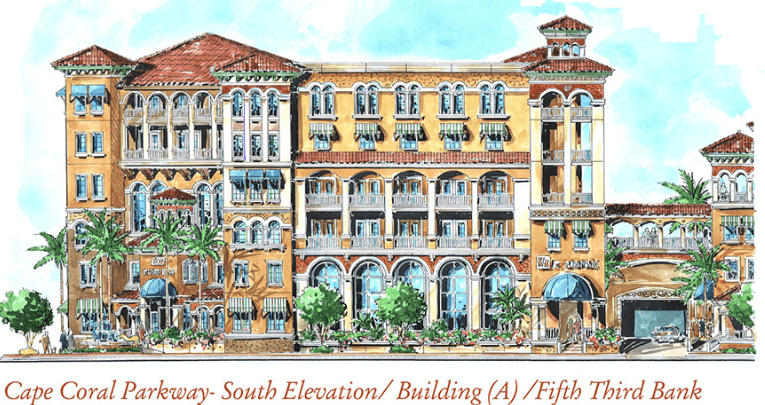 Filling the entire 800 block of Cape Coral and Southeast 47th terrace (a four acre city block, with frontage on Cape Coral Parkway, Southeast 47th Terrace, SE 9th Place, and SE 8th Court), the complex will feature three clusters of Mediterranean-style mixed-use buildings, all connected at the third-floor level by a covered walkway. The site plan includes three six-story buildings, a seven-story building and a six-story parking garage for retail and offices, a public square and two residential towers. The 938-space parking garage will have 127 spaces dedicated as public spaces. An important public component of the Village Square project is this nine-story building known as “The Center,” adjacent to the public fountain and central corridor. To support governmental and public activities, 3,000 square feet of office space will be donated to the City Council and to the community police. The Center will include: general office space; a large, high quality meeting space that can support both public and private meetings and small conventions; as well as performance venues suitable for a dance club, theater, comedy club or other performance spaces. 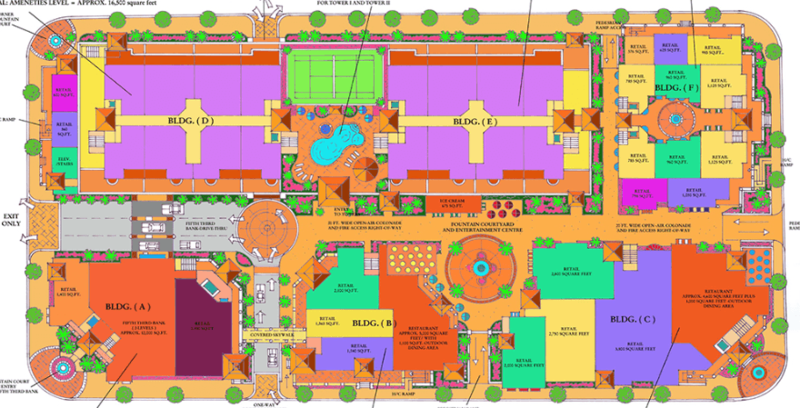 Residential units will vary in size from 1,250 to 3,375 sq. ft., supporting a variety of household incomes and sizes. Exclusive townhouses and penthouses will offer premier residential options, and represent one of the major highlights of the project’s residential development. Two-story townhouses will have green areas on the roofs and oversized penthouses will have large terraces and private two-car garages. Developer Robbie Lee was awarded the project by the City pursuant to a submission in response to a Request For Proposals issued by the Community Redevelopment Agency (CRA) in 2006. The CRA offered one of the City’s parking lots in exchange for the assemblage of properties and redevelopment of a large well designed mixed use project. 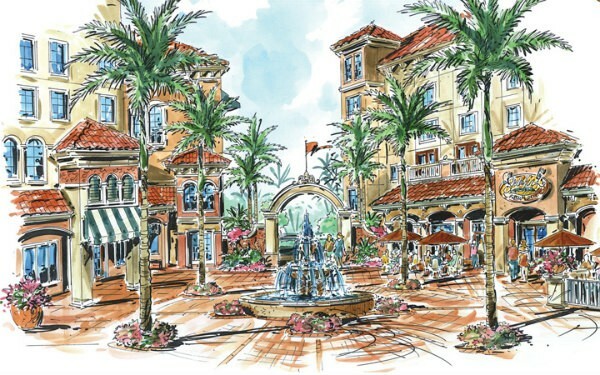 Steve Turner, lead designer of Village Square, has been one of the most creative designers of innovative projects and developments throughout the City of Cape Coral. Mr. Turner is the creative genius behind the design of Cape Harbour, Marina South, Marina View, Rumrunners and more. Involved since the conception of Village Square, Annette Barbaccia, President of AMB Planning has been instrumental in helping to design the project and by getting City approvals for all major elements of the project. In April 2019, the Village Square project has received another extension from the Cape Coral council and hopes are that the project will finally get underway. Council approved the $130 million Village Square project back in 2010, but the Great Recession, natural disasters, and a change in a federal program the developers are using to help fund the project have led to the project’s extension over the years. With the new extension that the mayor and council unanimously approved, a permit to begin construction could be approved next July, with demolition of the structures on the property happening this December.